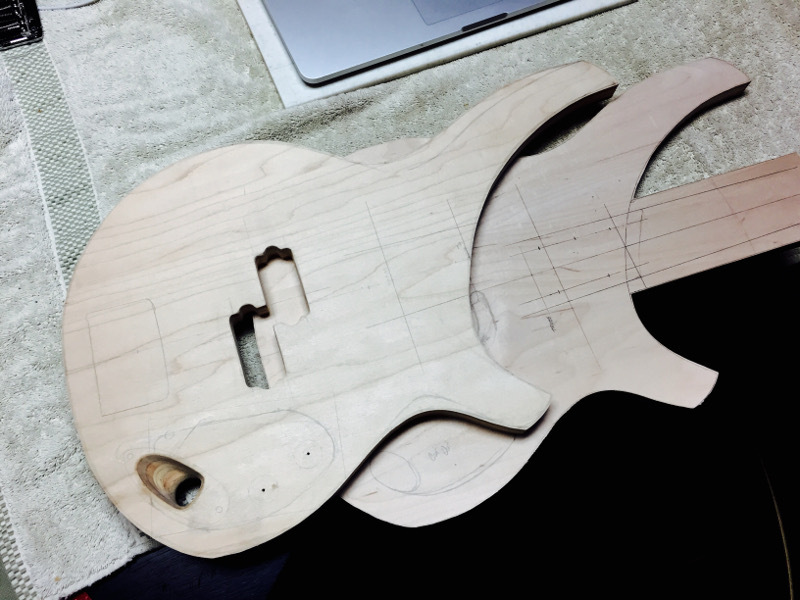 Constructing the iBass body out of two pieces of plywood makes routing out the body cavities much easier. It gives you complete access to the interior of the body for cutting cavities and then the two pieces can be glued together. It’s not only convenient but allows us to minimize the size of the cutouts. Our pickups are a passive set of EMG Geezer Butler signature p-bass pups. One master volume and one tone control, that’s it. No battery, no pre-amp…simple. The body is going to be milk-painted to cover our “exotic” plywood and to give it the distressed look it deserves. We’re still working out the graphics, but it will be heavily distressed. This week we’ll be working on the truss rod for the neck and working on the fretboard. The fretboard is radiused at 12″ and scale is set at 30″. We’re going with a bladed headstock with all the tuners on one side, Fender-style, but with our own shape similar to a tanto or Japanese short sword.